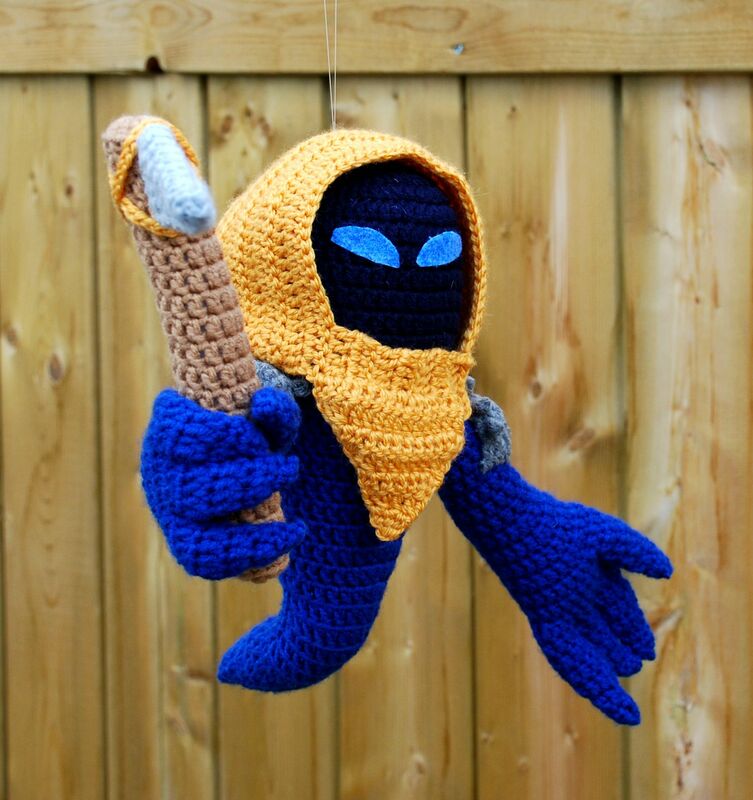 Twisting yarn and games together. I really liked Bastion, and am all kinds of excited for Supergiant’s new game. What you do for the colour change doesn’t really matter, since it will be hidden by the hood. I suggest sc the last stitch in navy, then sc the next st in royal just to make it a bit easier. Begin stuffing around here and continue to stuff as you go. Ch 3, sl st 2 back down chain, sc 2 in next 2 sts. Finish, making the bottom as pointy as you can. Round 1: With yellow and 4.5 mm hook, sc 6 in a magic circle. Continue in a spiral. Line up the 4 sts you have been working (strap sts) with the last 4 sts on the opposite side of the hood (hood sts). 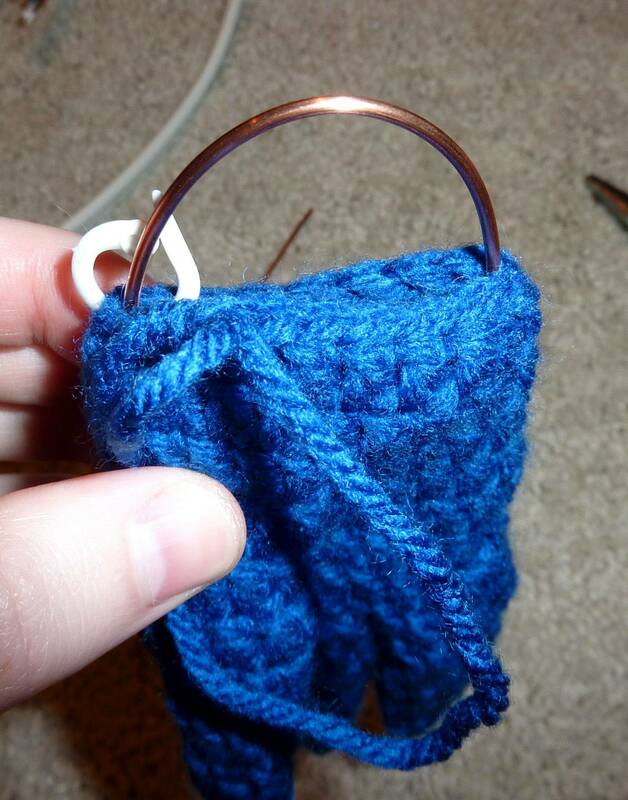 Insert your hook through the back loop of the fourth hood st (counting from the left), then through the back loop of the first strap st. Catch your yarn, pull it through, and slip the stitch. Repeat for the next three sts. This joins the strap to the hood. Double check that it fits over the gasfella’s head. Chain 1 (or however many you chain to turn then dc) and turn your work so you will continue along the bottom edge of the strap. Pick up and dc sts evenly along the bottom edge until you get to approximately the opposite spot on the other side. You want and odd number. I had 17. Turn. The arms and fingers are wired so they are posable. Don’t stuff anything until noted. Row 2: sc 2 in 1 x3 (6 sts) Do not turn. Cont. in a spiral. Sc 1 and cut yarn leaving a tail long enough to sew up the gaps (first three fingers only). There will be a bit of an opening at the bottom from working in rows. 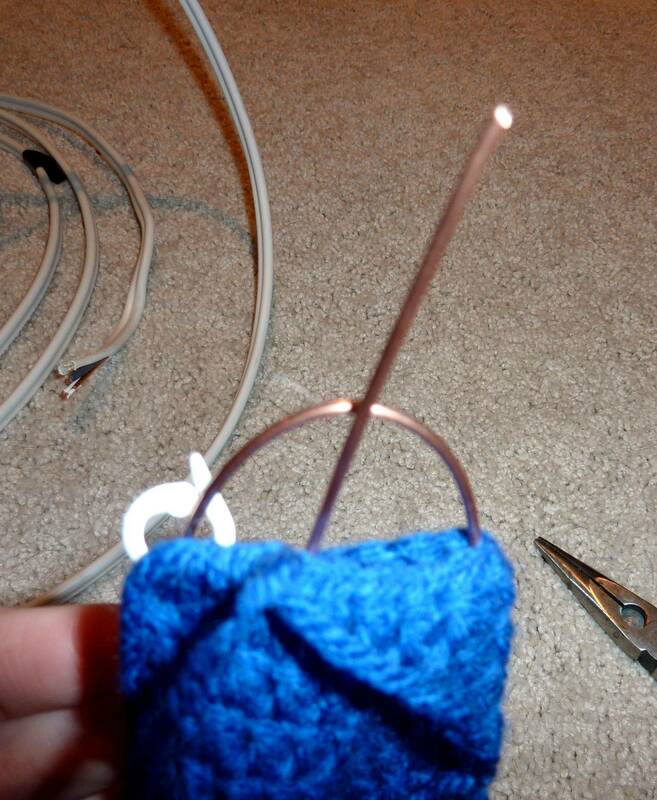 Stitch it up with the tail of the yarn and pull it inside the finger. 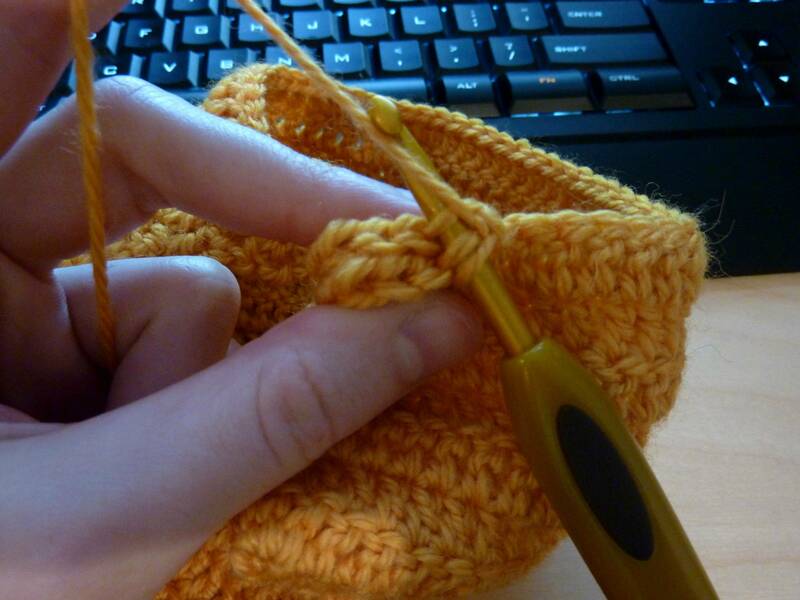 Stitch the gaps between the fingers closed and tuck the yarn ends in. Cut a length of wire long enough to go from the thumb to a little past the point on the arm that you’ve worked up to, plus a bit extra. Bend over one end of the wire. Cut a length of wire long enough to go from the first finger to a little past the point on the arm that you’ve worked up to twice (so measure, then double it) and a bit extra. Bend over both ends of the wire, then fold it in half. 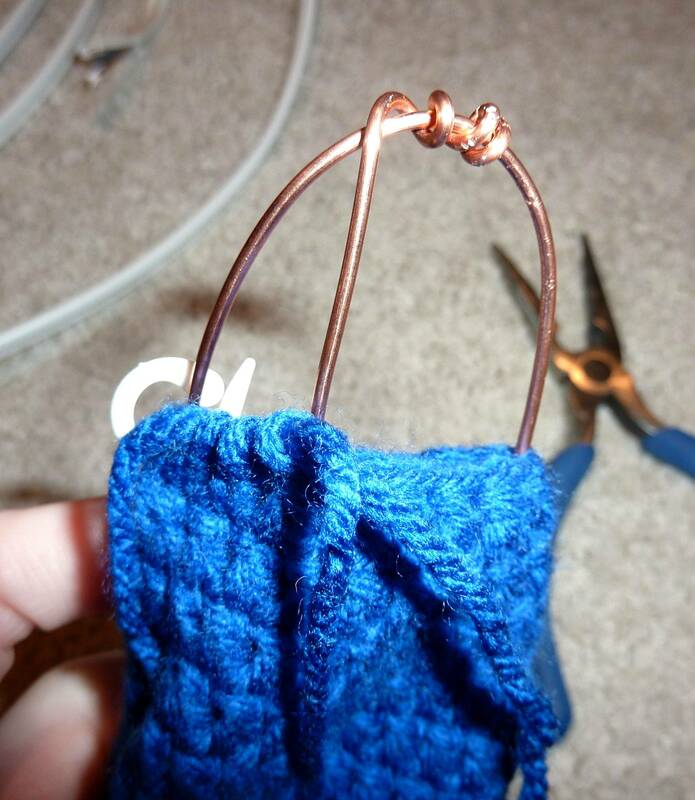 Insert the folded finger wire into the hand, making sure the wires are going into the first and third fingers. Then insert the thumb wire and wrap the unbent end around the curved middle part of the finger wire, making it as tight as possible. You may need to pull it out part way to do this. 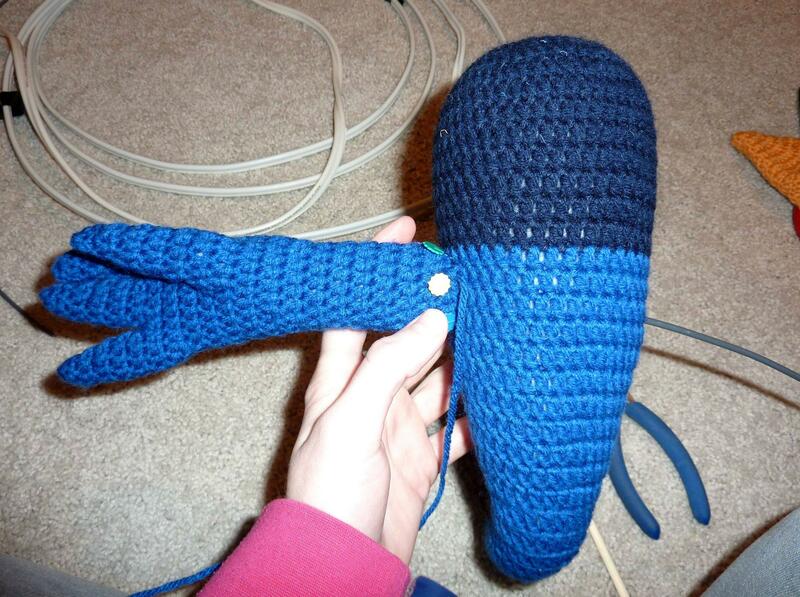 Continue on with crocheting the arm. Finish, leaving a long tail for sewing. Make four more fingers and join the first three as for the left hand. Finish the right arm as for the left. Cut a length of wire long enough to go from the middle finger, through the body, and to the other middle finger. 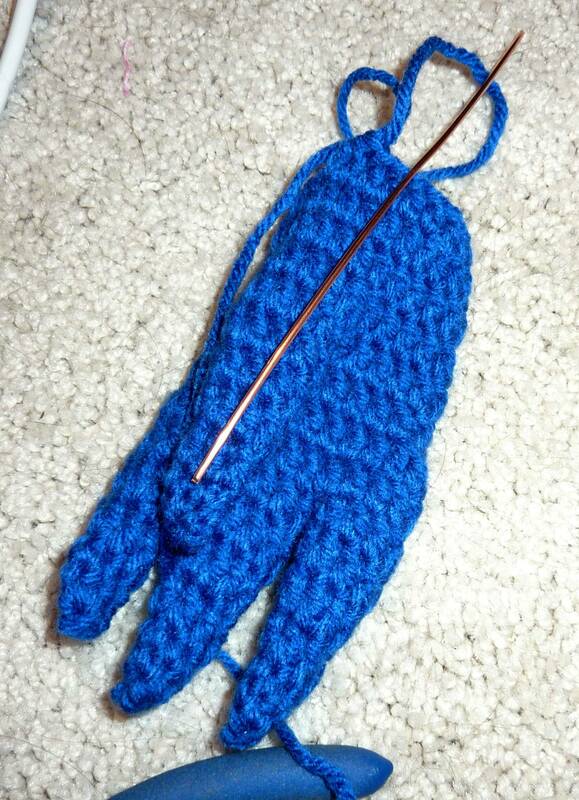 Bend over one end and insert it into one of the arms, making sure it goes into the correct finger. Stuff the hand very lightly, and the arm a bit more firmly. 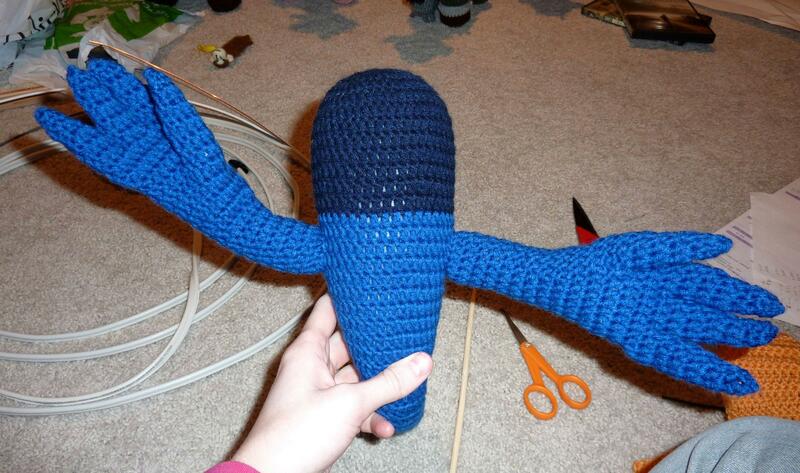 Finally, a use for the poking stick that comes with stuffing. 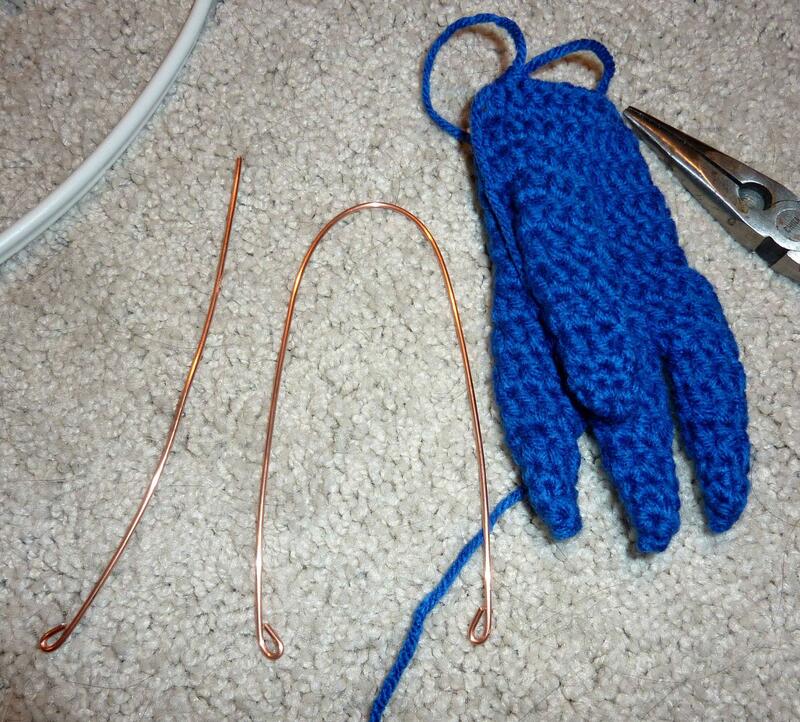 Once the first arm looks good, stab the long end of the wire through the body and out the opposite side. I placed it about three rows down. Bend over the wire end and pop the other arm on. 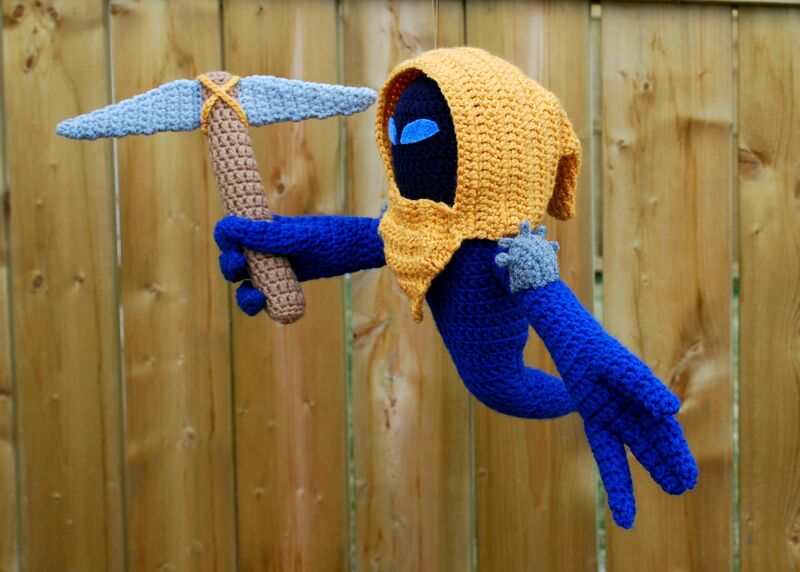 Now get even more use for the poking stick and try to stuff the second arm as well. Pin the arms down and make sure they’re where you want them, then sew in place. If all has gone well, the arms and hands should be bendable. The arms won’t want to hold terribly difficult poses because of the weight of the arms, but it should work for typical gasfella poses. With dark grey and 4.0 mm hook, ch 2 (1 to turn). Leave a long tail. Sew the shoulder guards onto the shoulders of the gasfella, making sure that the arms can still move fairly freely and the guards don’t get squashed when moving them. With grey and 4.0 mm hook, ch 7 (1 to turn). Leave a long tail. Finish, leaving a long tail. When the four blades are made, cut out two pieces of the plastic canvas in the shape of the blades. Place the plastic between two fabric blades and sew them together, starting with the narrow end. Leave the wide end (that will attach to the handle) open. Round 1: with topaz and 4.0 mm hook, dc 12 in a magic circle. Continue in a spiral. Sew the blades to the handle using the remaining tail ends of the yarn from the blades. For the bands that wrap around the top of the handle, use yellow and ch two lengths long enough to wrap around, then stitch them down. 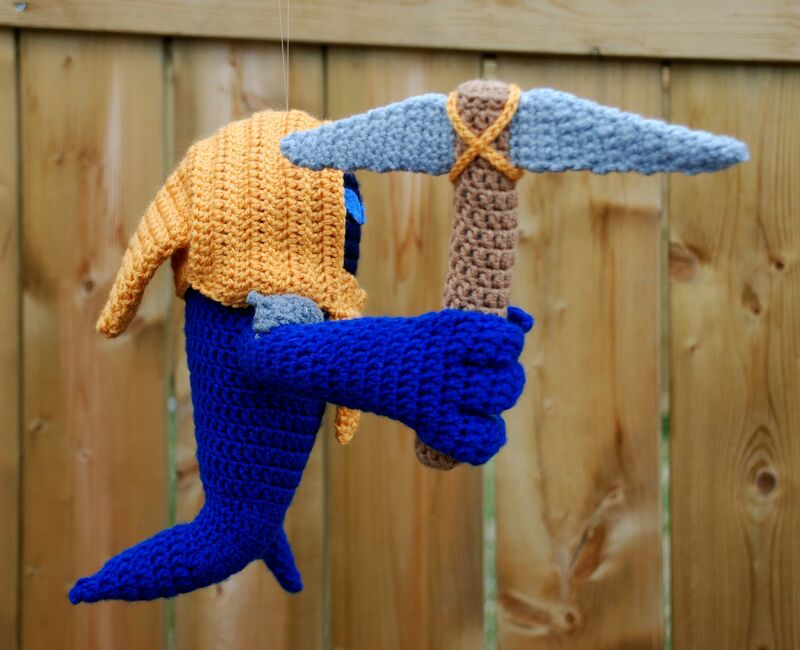 The gasfella should be able to hold the pickaxe on his own without needing to sew it to his hand. 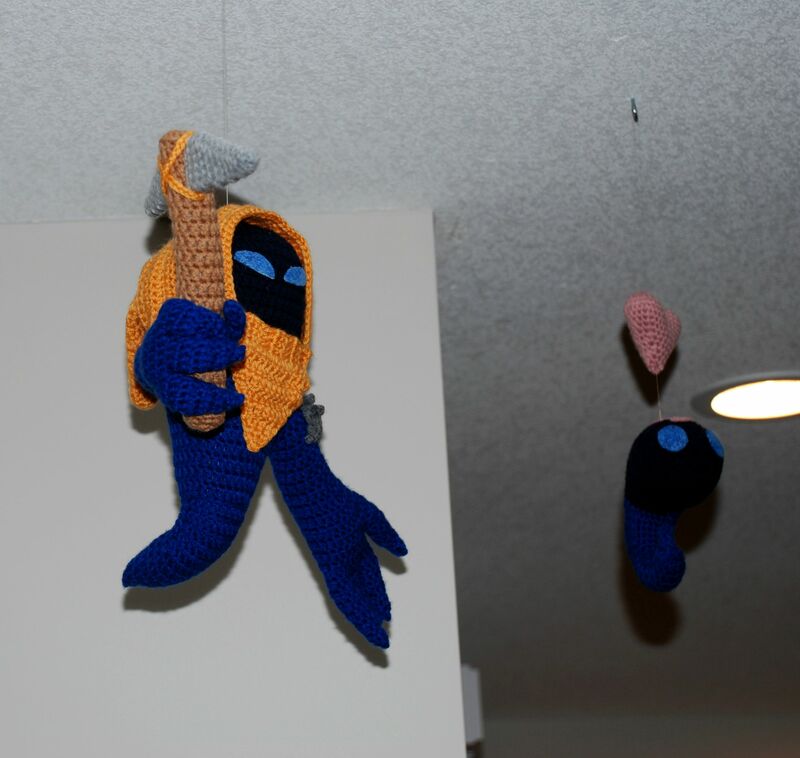 Use fishing line to attach a loop to his head to hang him from a hook in the ceiling. Tutorial is awesome! This one will definitely have to try because of the wires. I love “experimenting” and trying different things and possibilities with my dolls. Guess will learn a lot from you! 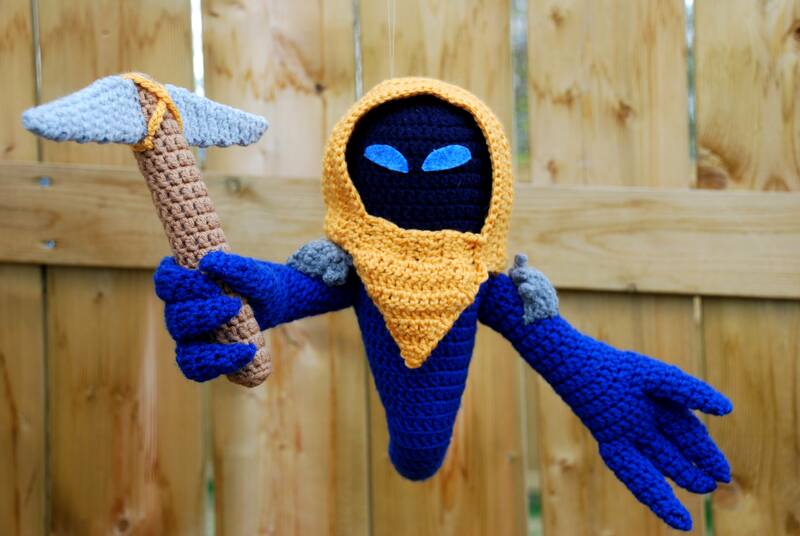 Your patterns and tutorials are great! Thank you! Do let me know if you try it :) Also if you have any questions about wiring joints, I’d be happy to help.